Spanish investigators are still trying to determine what caused an inflatable bouncy castle to rocket into the air with seven children inside. What is known, however, is that the normally harmless structure - located outside a restaurant in the northeastern town of Caldes de Malavella - reached as high as 65 feet above the ground and traveled about 130 feet before crashing to earth. In the meantime, Spanish police say, seven children between the ages of 3 and 11 were injured, including one 6-year-old girl whose injuries were so grave she died several hours after being transferred to a hospital in Barcelona by helicopter, according to the Associated Press. A 9-year-old boy and a 7-year-old girl were also taken to the hospital with multiple serious injuries. The Spanish newspaper El Pais reported that all of the injuries occurred when the children were thrown from the attraction. Carles Puigdemont, a prominent Spanish Catalan politician, tweeted his condolences to the victim's family. "My condolences to the family through this tragedy," he wrote. "All the affection and solidarity in these times so painful. Rest in peace." The cause of the incident has been narrowed down to several possibilities. El Pais reported that the castle was inappropriately anchored to the ground, with only two of its required six stakes in place when the incident occurred. The paper reported that the restaurant's owner did not have a proper license to operate the attraction. Some witnesses also told the paper that they heard an explosion, which some speculated may have been related to the castle's safety valve. Investigators are still trying to determine whether a gust of wind or an explosion lifted the castle off the ground and leaving debris on tops of trees and the roof of the restaurant, the paper reported. In the United States, the Consumer Product Safety Commission reviewed emergency room data before tallying more than 18,800 injuries in 2012 related to inflatable attractions, such as moon bounces and bouncy castles. The vast majority of those injured were children below the age of 14. Some children have been injured when the structures deflate suddenly, while others have been injured when the powerful gusts of wind send inflatable castles skyward. In 2015, three children were injured when a tornado swept a bouncy house off the beach and into the air in Fort Lauderdale, Florida, according to the Sun Sentinel. Video captured at the scene showed the house being flung 50 feet above the ground. "It was scary, scary," Shamoya Ferguson, 6, told the paper. "I was thinking that I was about to die." Last year, a 7-year-old in Essex, England, was playing in a "Toy Story" bouncy castle when a strong gust of wind lifted the inflatable structure off the ground. Summer Grant was carried over trailers and caravans before it crash landed down a hill nearly one mile away, the Associated Press and Sydney Morning Herald reported. "A 24-year-old woman and 27-year-old man were arrested on suspicion of manslaughter by gross negligence in connection to the incident, according to the BBC.
" 'It was a sudden gust,' Ray Smith, a representative of the Showmen's Guild of Great Britain, told the BBC. 'Had it been a consistent wind, they would have closed down all the inflatables.' "
Smith said he was confident that the Thurston family, which organized the annual fair, had properly staked out the inflatables. 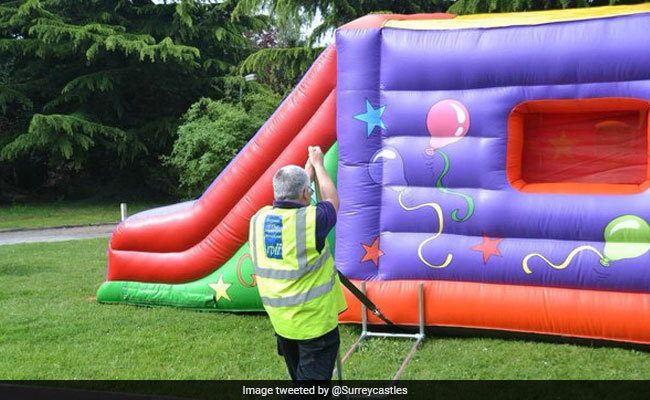 As local police opened an investigation into the incident, Wang reported, Robert Halfon, the Conservative MP for Harlow, demanded that authorities consider a ban on bouncy castles. Only a year earlier, at the same park, a bouncy castle collapsed on a children who were playing inside it. "I will be asking the relevant authorities to start an urgent inquiry as to how this tragedy happened," Halfon wrote on Facebook, "and to consider whether bouncy castles such as this should be banned from Harlow Town fairs, until we can be sure that they are completely safe, so such a horrific tragedy never happens again."